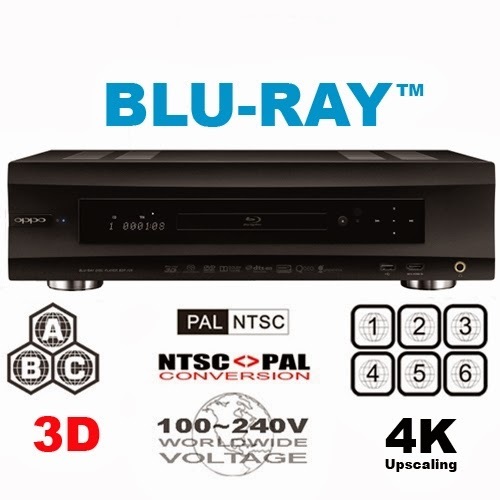 An Oppo region-free Blu-ray player might be a brand name you haven't heard before, even though it should be known in every household. It seems only technophiles up on the latest Blu-ray technology know Oppo and everything they've offered in players over the last several years. Considering they usually only sell their players online and not in retail stores could explain why it's been a more inclusive group buying Oppo's products for years. Take a look at why Oppo Blu-ray players are so superior and why they're well worth the extra price you pay. Here at Bombay Electronics, we offer them for less. We've also reconfigured the players to make them region free so you can buy and play Blu-ray discs from overseas. If you're looking for a thin and light Blu-ray player, you may have to stick with another brand. But the brands we all know from retail stores still make Blu-ray players that suffer through technical issues. Oppo is a little bulkier in design, yet it's a plus in having durable component parts. Oppo players are also known for having very few if any issues with problems like freezing or not accepting certain discs. Thanks to Oppo releasing firmware updates regularly, they can tackle virtually any Blu-ray disc. Now with our region-free upgrade, any disc can be played from around the world. Oppo is known for making Blu-ray players with superior audio capability. It's no different with their recent models, including our region-free players. You'll get Dolby TrueHD sound that's close to studio master quality, plus DTS-HD Master Audio for sound matching the lifelike images. Overall, you have to hear it for yourself to notice that Oppo gives a boost in sound other leading Blu-ray players don't have. In the last couple of years, Oppo finally offered assess to Netflix and other online media sources on their players. It took a while for them to include these, yet they've always offered other media capabilities others didn't have. This includes compatible media like HDCD's, MP4's and various audio formats to name just a few. They also can convert any 2D movie into 3D with the press of a button. This and more recent Oppo models even convert up to 4K automatically. To show how comprehensive Oppo has been and still is, you can connect virtually any media device to the player. This includes set-top boxes, smartphones and even tablets. It's a Blu-ray player with few limitations and can turn it into its own media center without taking up a huge amount of space. Come and buy our Oppo Blu-ray players here at Bombay Electronics and see for yourself why Oppo should be a household name. You'll be able to enjoy any region DVD without worry of making a phone call to tech support. Contact us if you have any questions or comments about our electronics inventory. We're here to help gain the best discounts on the best names electronics have to offer.